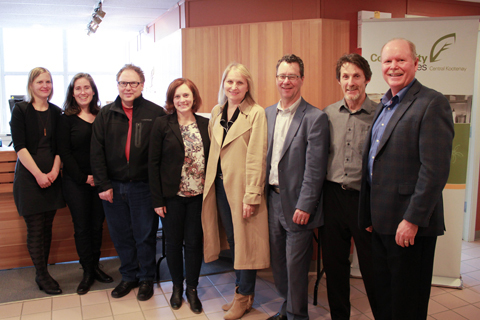 Michelle Mungall visited the office of Community Futures Central Kootenay to announce the Rural Dividend Funding grant awarded to the Nelson Innovation Centre. Under the BC Rural Dividend Program, the Government of British Columbia is providing $1,424,303 for nine projects in the Kootenays, Katrine Conroy, MLA for Kootenay West, and Michelle Mungall, MLA for Nelson-Creston, announced today on behalf of Doug Donaldson, Minister of Forests, Lands, Natural Resource Operations and Rural Development. 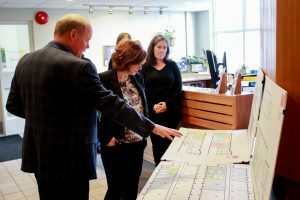 Among the funded projects is the Nelson Innovation Centre, a project of Community Futures Central Kootenay and the Nelson and Area Economic Development Partnership. 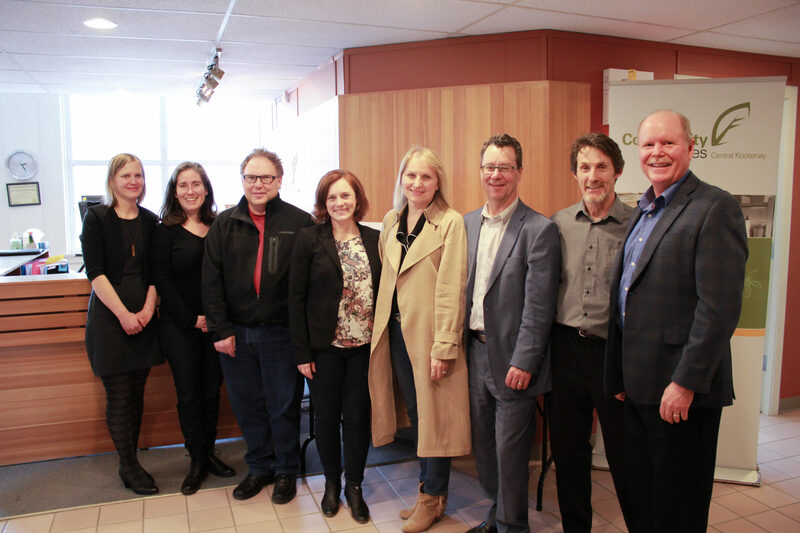 Nelson Innovation Centre is being awarded $100,000 to support the development and implementation of five core services, including access to capital and business start-up programs. “By helping local people deliver projects they know will make a real difference for their communities, we are building a foundation for healthy, robust, and sustainable economies across our region,” said Mungall. Community Futures of Greater Trail was also among the successful applicants, and will be awarded $100,000 to promote and market Kootenay sport fishing. The project will boost local economies and create jobs for guides, tackle shops, marinas, accommodation providers, and others. Paul Weist shows Michelle Mungall the architectural drawings for the Nelson Innovation Centre. Arrow and Slocan Lakes Community Services is being awarded $268,483 to continue developing the Mount Abriels Trail Network in 2018-19. Project activities will include trail work, installing signs, building staging areas and kiosks, and constructing a bike-skills park. The funding is part of nearly $8 million in 58 project grants awarded to eligible local governments, First Nations, and not-for-profit organizations through the BC Rural Dividend Program. The rural dividend encourages economic diversification, innovation, sustainability, and collaboration, and recognizes the diverse needs of individual communities.